Reiki helped Australian Shepherd, Sparky, cope and deal with life-threatening Lymphoma. A few years ago, when my Animal Reiki teacher, Kathleen Prasad, put out the call for stories to include in her book about how Reiki helps dogs, I jumped at the opportunity to share Sparky's story. Now In Spirit, Sparky taught me about the power of Reiki especially when it comes to helping dogs and other pets with cancer. Sparky, a sweet, shy and loving Australian Shepherd, holds a special place in my heart. I've known him since he was rescued by his person, Barbara, seven years ago. Sadly, Sparky was diagnosed with lymphoma last summer. His body is riddled with lumps of various sizes and shapes with the largest mass located under his right shoulder. The two tumors under his jaw clearly affected the quality of his life since they made eating difficult and painful. At the time of Sparky's diagnosis, Barbara felt chemotherapy and radiation were not the right option, especially since it meant frequent visits to the vets, which would create a lot of stress for Sparky. So Barbara decided to let Sparky live out his life with minimal medical intervention. She felt in-home Reiki treatments for Sparky were a good idea since she had good results using Reiki to help her other Aussie, Duke, now In Spirit, when he was suffering with a chronic lung infection. Sparky’s first Reiki treatment lasted a little over an hour. A bit nervous at first, Sparky walked in and out of my space throughout his treatment. It was clear by his actions that he recognized Reiki and liked how it felt. By the end of the treatment, Sparky seemed more relaxed. Barbara and I discussed doing follow up Reiki treatments combined with Animal Communication to support Sparky despite his lymphoma. Two months later, Barbara called me to schedule Sparky's second Reiki treatment. She said she didn't call earlier for a follow up treatment because Sparky’s quality of life had gotten significantly better after his initial treatment. Barbara reported that the lumps in Sparky’s jaw were approximately 75% smaller in size and his energy level, along with his appetite, went way up. Plus the large lump on his shoulder was significantly smaller and less painful. Since Barbara noticed that the lumps under Sparky’s jaw and on his shoulder had become enlarged again, she felt another Reiki treatment was indicated. Shortly after I arrived at Barbara's house, Sparky, who is generally hesitant about being touched, made it clear that he wanted me to start his treatment immediately. Once I initiated the Reiki, Sparky immediately placed his right shoulder directly into my hands. He sat with me for quite awhile before he would get up and walk around for a few minutes. He'd then return a few minutes later placing his shoulder into my hands again. This treatment last about an hour. Once Sparky felt complete, he drank some water and asked to go outside to relieve himself. Once he did his "business," there was a clear spring in his step as he initiated play with his younger sister, Delilah, a Bull Mastiff teenager. Shortly after Sparky's second treatment, he showed signs of improvement again. He easily made the move from California to his new home in Oregon. He is currently enjoying his life with his family on their new ranch. While Barbara doesn't know how long Sparky will be with her, she is enjoying every day with her special boy. She says it helps her knowing that Reiki and Animal Communication are always there to support her and Sparky. According to Prasad, the lesson learned from Sparky's case is: "No Condition Is Too Big for Reiki to Help." Is your pet sick? Animal Reiki can help. 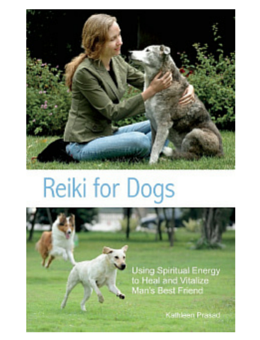 While Reiki is never a replacement for veterinary care, it can help your pet's quality of life. For more info, visit my website or email me.